The most accomplished sniper in history accumulated 505 confirmed kills over a period of three months. I racked up 518 playing through Sniper Elite 4's single-player campaign mode in a little over 20 hours, most of which was spent hiding. Good times. I am not normally a stealth gamer. I lack the patience to wait for the guards to turn their backs, the patrol to march out of earshot or the glowing eye to avert its cone of vision. While others enjoy a sense of accomplishment for making it through a game level unseen by enemies, I’d much rather outrun or out-shoot whatever lies between me and my objective. And yet Sniper Elite 4 is very much a stealth game. This latest installment of Rebellion Developments’ World War II shooter series sees Lieutenant Karl “Sniper Rifle With Legs” Fairburne aiding the Italian resistance against the Fascists in 1943 Italy. Thankfully, Italy had a lot of bushes to hide in back then. Depending on how one plays, Sniper Elite 4 can involve a great deal of waiting. 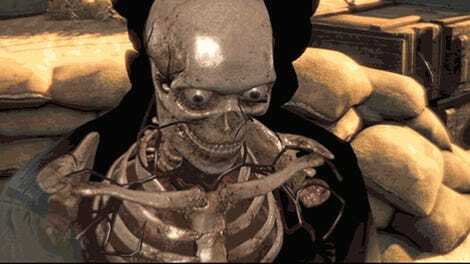 The majority of the 20-plus hours I spent working through the game’s eight expansive core campaign levels involved me sitting somewhere just out of sight, waiting for the enemy to get tired of looking for me. The difference, for me, is the payoff. Some people can’t handle to gore-cam shots. I love the stupid things. When I duck into some dense foliage to watch for the dots representing enemy soldiers on my mini-map to turn from red (actively hunting) to yellow (cautious), I know that when I’m finally clear to emerge without getting shot to hell, retribution will be swift and satisfying. While they scour my last known position, I’m marking targets, lining up shots or going through my inventory to see what sort of fun explosive things I can lure them into. The campaign levels are massive, giving players plenty of freedom in how they go about getting things done. And so I stealth, taking my own sweet time working my way from objective to objective in Sniper Elite 4's spacious campaign maps. I find a nice spot, use my binoculars to mark every target I can see, and then cycle through different means of dispatch. Maybe I’ll just sit in my perch and alternate between sniping and hiding, never giving the enemy time to figure out where the shots are coming from. Or fill an open building with tripwires and mines, using tossed rocks or the sounds of stray gunfire to lure enemies to their doom. Sometimes I’ll just hang out in the bushes, waiting for just the right moment. The enemies are slightly smarter in Sniper Elite 4, but they are still at the mercy of game mechanics. It’s neat that enemy squads will now realize when one of their number is missing and go looking for them, but really it’s just another way for the player to manipulate them into dying. They ignore obvious sniper nests in favor of wandering about the area, as if daring the player to shoot them. It’s a good thing shooting them is so much fun. 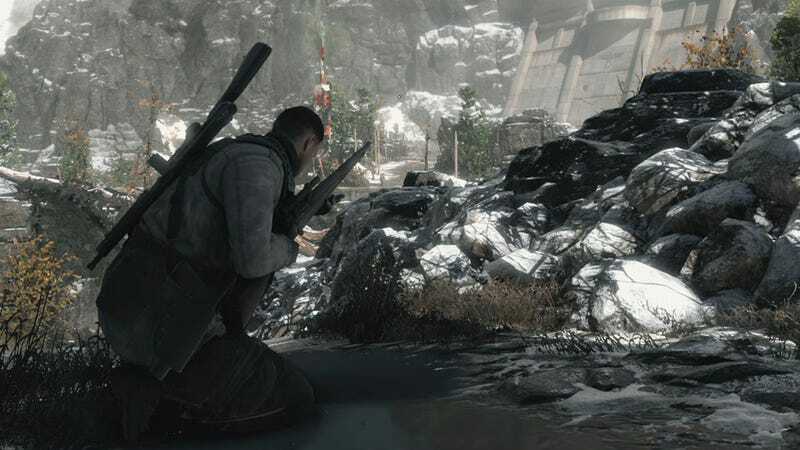 Rebellion’s head of creative, Tim Jones, said the studio wanted to make Sniper Elite 4 “a sniper’s paradise,” and they’ve succeeded. The levels have much more verticality to them this time around, and Karl’s new climbing abilities allow him to set himself up some pretty sweet sniper’s nests. There are explosive objects and environmental elements that can be used by the player to mix up their killing style. Sniper Elite 4 can be very pretty when it wants to. Those looking for more motivation to mix things up can take on a series of special level challenges for extra rank, such as going though an entire mission without tagging anything. The game’s weapons offer their own challenges, which can be completed to upgrade stats and unlock new skins. Here’s where I ran to after setting up a series of mines and wire traps and then making as much noise as possible. I will never forget this spot. 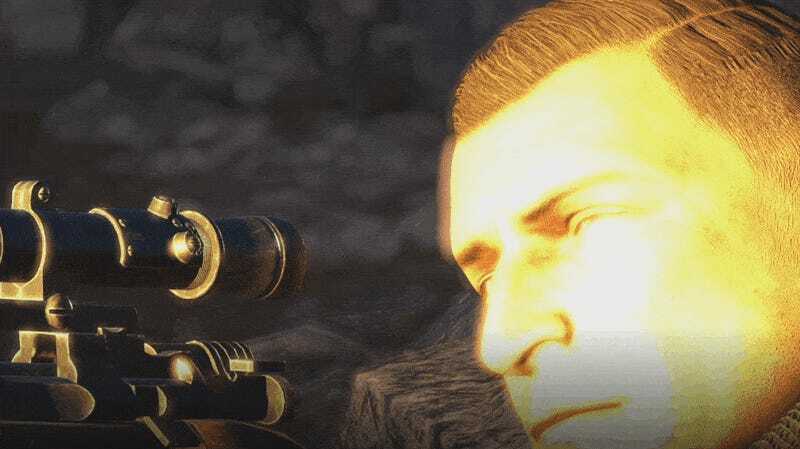 There is a story to Sniper Elite 4. It involves Karl working together with the Italian resistance while attempting to stop a Nazi who plans to use special missiles to kill all the people, or something. It’s just difficult to focus on the plot when the couple of minutes of pre-briefing is followed by two or three hours of hide and snipe. The map reminds players of what their objectives are. Documents picked up in the game flesh out characters and situations. Hell, Karl even talks to himself now and then, muttering about the current situation. It’s all drowned out by my need to shoot many people from as far away as possible. No doubt some people will find sneaking around and killing hundreds of samey bad guys for hour on end tedious. I can see that. There were times while I was playing that I looked out on all the marked targets and felt overwhelmed, especially knowing how long it would take me to pick them off. But then I’d take that first shot, and before I knew it an hour had gone by and I owned that part of the map. Then I’d take a celebratory stroll over to the next place filled with enemies and start all over again. I can’t speak to players who prefer to run and gun wherever possible, as that was not my style playing through Sniper Elite 4. I am a patient shooter, fully prepared to dig in for as long as it takes to make the next head, heart, lung, gut, eye or testicle shot a horrible surprise. Playing it that way, Sniper Elite 4's campaign is a blast. I didn’t get to play any multiplayer, as the game hadn’t been released as of this writing and the community wasn’t there yet. Once I’ve gotten some time with cooperative and competitive online sniping, I’ll let you folks know how it turns out. Sniper Elite 4 arrives on PlayStation 4, PC and Xbox One on February 14.